A concise, declarative, and machine executable specification of the Hindley–Milner type system (HM) can be formulated using logic programming languages such as Prolog. Modern functional language implementations such as the Glasgow Haskell Compiler support more extensive flavors of polymorphism beyond Milner’s theory of type polymorphism in the late 70’s. We progressively extend the HM specification to include more advanced type system features. An interesting development is that extending dimensions of polymorphism beyond HM resulted in a multi-staged solution: resolve the typing relations first, while delaying to resolve kinding relations, and then resolve the delayed kinding relations. 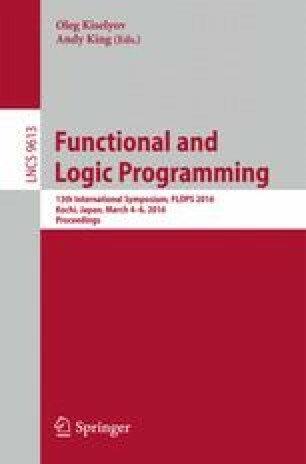 Our work demonstrates that logic programing is effective for prototyping polymorphic type systems with rich features of polymorphism, and that logic programming could have been even more effective for specifying type inference if it were equipped with better theories and tools for staged resolution of different relations at different levels. Thanks to Patricia Johann for helping us clarify the specification for Mendler-style iteration, Ekaterina Komendantskaya and Frantisek Farka for the discussions on S-Resolution, Peng Fu for pointers to Kanren, Chris Warburton for careful proofreading, and FLOPS’16 reviewers for their feedback.